Welcome to the 4th Annual Sunnyside Post Mile! 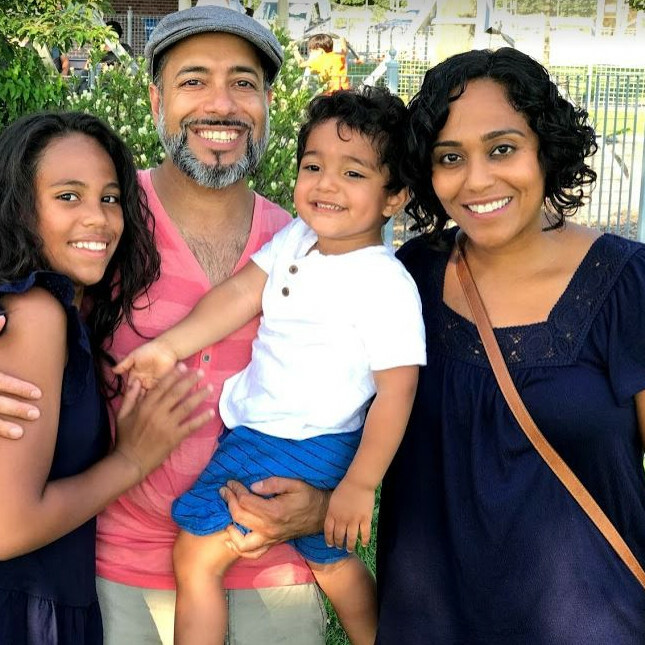 The Queens Post is proud to bring back this popular, family-friendly event, and raise funds for Sunnyside Community Services, a multi-service, community-based, not-for-profit agency that provides programs for individuals of all ages. The Woodside-Sunnyside Runners will return as Race Directors. They bring with them years of expertise in participating in, and organizing runs all across the city. This event is taking place on Saturday, September 29, with the ceremony kicking off at 9:30 am and the Mile beginning at 10:00 am. It will be followed by children's dashes on Skillman Ave. at 10:45 am. We also encourage you to join us in raising even more funds for SCS by setting up your own fundraising page or forming a team. Follow the simple steps when you register. Bibs, t-shirts and registration will also be available Saturday morning between 8:00-9:00 am before the race (shirts for day-of registrants will be limited and not guaranteed). Avoid long lines by signing up now and picking up bibs & t-shirts before race day! Q: Where and when is bib and t-shirt pickup? A: T-shirts and bibs can be picked up Thursday and Friday evenings, and Saturday morning before the race. If picking up pre-race, please allow extra time. Q: Can I register on race day, and does it cost more? A: You are welcome to register on the day of the race (allow ample extra time before the 10 a.m. start), and can also sign up in person at the two bib pick-ups on Thursday and Friday. The cost does not change. Please note that t-shirt sizes are not guaranteed for late entries. A: Proceeds from the race benefit Sunnyside Community Services. We invite you to visit their web page for more detailed information. More than 14,000 people a year find the help they need at Sunnyside Community Services (SCS), located in the heart of western Queens. SCS provides options for the whole family, from free full-day pre-kindergarten classes to college and career readiness programs, a vibrant center for active older adults, flexible home care options that allows older adults to live independently and safely at home, and a social adult day program for individuals with Alzheimer’s and dementia. SCS offers free Home Health Aide (HHA) training and employment opportunities, English language classes, benefits assistance programs, and a city-wide service to support caregivers of loved ones with serious illnesses. Sunnyside Community Services has been “lighting up lives with programs as diverse as the people they serve” since 1974. Find out more at http://www.scsny.org or email info@scsny.org. Q: Will I be able to choose a T-shirt size? A: Yes, but T-shirt sizes are not guaranteed. We will order ample supplies of requested sizes and offer them on a first come, first served basis. Pick up your bib and shirt early to ensure your requested size. Q: Will there be baggage check for the event? A: There will be a designated space that will be supervised by a volunteer near the start/finish to leave bags. Race organizers are not responsible for lost or stolen items so we recommend you keep anything of value on your person or at home. Q: Can my child participate in the mile? A: Children registered for the Skillman Dash may join their parent or guardian for the Mile run/walk before the Dashes begin. Children over the age of two (2) joining parents for the Mile and not planning to run a Dash should be registered for either the Dash or the Mile. Please note that children who want to have their mile timed must be registered for the Sunnyside Post Mile to receive a bib with a timing chip. Q: Will my dog be able to participate? A: Leashed dogs are invited to run or walk with their owners for the mile. However, we ask that they line up at the back before the event begins for a staggered start. Q: Can I bring a stroller on the one mile run/walk? A: Parents pushing strollers will be able to participate. Children under the age of two (2) years riding in a stroller do not have to register. Q: Will there be water provided? A: Water will be provided at the finish line. Bring some water to sip before the race. There is a water fountain at Lou Lodati Park, and the farmer’s market there will have cider and milk for sale. Q: Will there be restroom facilities? A: Yes. Torsney Playground at Lou Lodati Park has public restrooms open year-round. Q: Can I both volunteer and run the race? A: Yes! Some volunteer spots make it possible to both run the race and volunteer: Bib/T-shirt pick ups on Thursday and Friday before the race, and the Kid’s Dashes after the Mile. Q: How do we line up for the race? A: The race corral for the Mile will have a staggered start for safety - Leashed dogs will line up in back, preceded by runners and walkers with strollers, with runners and walkers in the front. A: Children’s Skillman Dash participants will receive an award after each Dash. An awards ceremony with medals for the Top 3 Sunnyside Post Mile male and female finishers will take place after the Skillman Dashes. 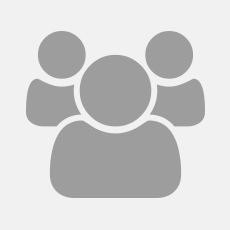 Q: When and where are the children’s Skillman Dashes? 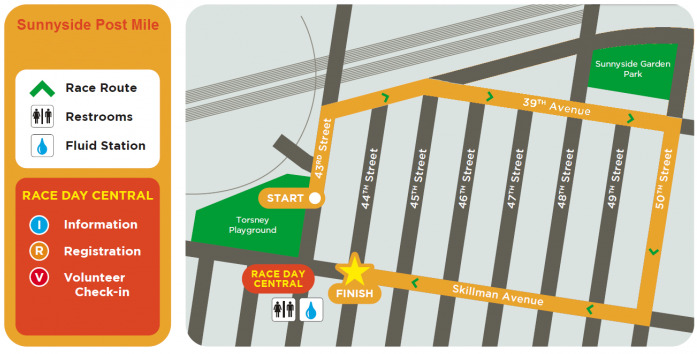 A: Children’s Skillman Dashes begin at 10:45 a.m. and will line up on Skillman Avenue close to 45th Street, running towards the Mile finish line at 44th Street. Ribbons for all Dashers will be given after each Dash. The distances are 25 yards for 2-3 year olds & 4-5 year olds, 50 yards for 6-7 year olds, and 75 yards for 8-9 year olds. Q: Who are all the race sponsors? 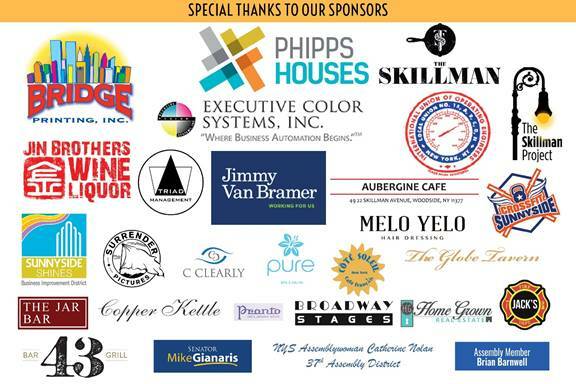 A: Thank you for asking, and THANK YOU to our diverse and vibrant group of local sponsors. Visit them online and in person soon!